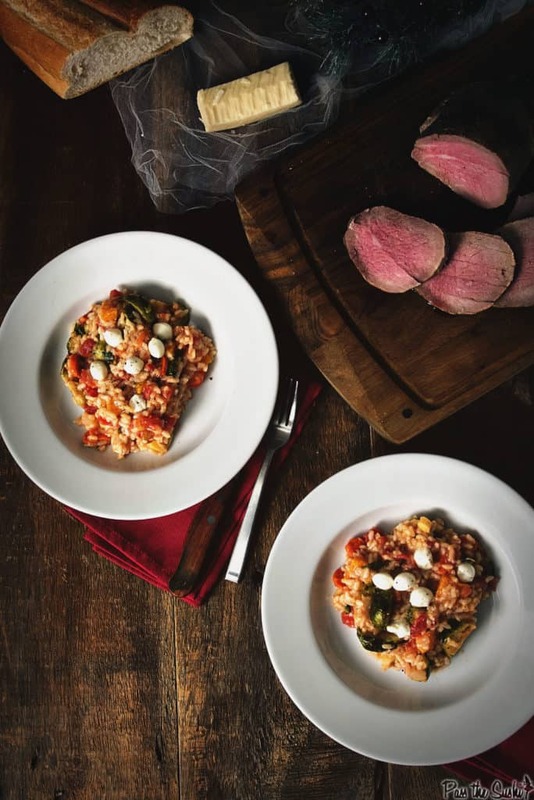 Whether the star of the show, or paired with a beautiful roast, this creamy veggie risotto should be a happy place for all of us! Go on, give it a try! Are you already planning a killer at home Valentine’s Day dinner, or will you be spending the night out with someone special? Valentine’s Day falls on Saturday this year which means two things – I will have time to actually make dinner and I won’t be wanting to deal with everyone else out at the restaurants! Weekends and I just don’t get along when it comes to dining out. So, I guess this one is on me! When it comes to special meals, I love the plotting and scheming. I love planning a menu and coming up with a really cool dinner idea for the both of us. From start to finish (yeah, expect some dessert posts) special occasion dinners may be my favorite Date-Night-In’s. Don’t get me wrong – going out from time to time is mandatory. Some days I just get stir crazy and have to try a new place. And some days I am so tired from work the last thing I want to do is cook. But, on those days where I can step into the kitchen, tie that apron around my waist and get working on what I do best… those days are awesome. I turn up the classics, light some candles, and find my happy place. 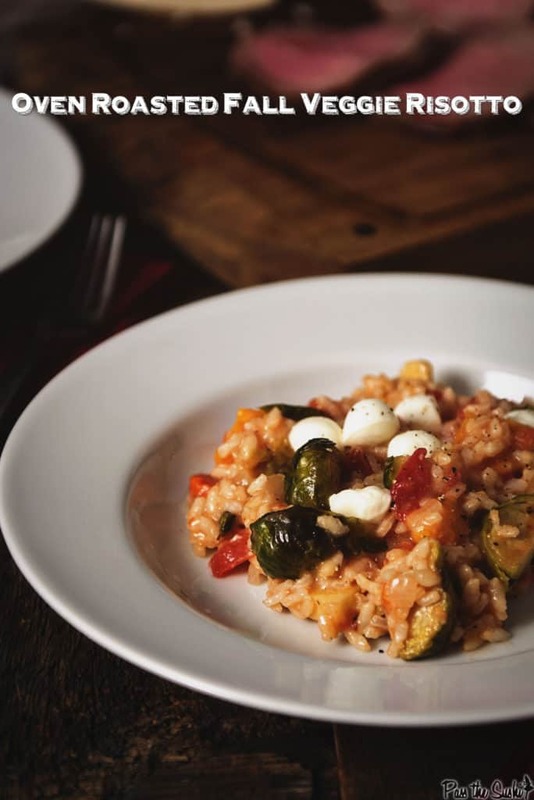 This risotto recipe, packed with delicious roasted veggies… this is my happy space. This one was inspired by a dinner I had while traveling in Seattle. I think it may have been the firs time this GirlCarnivore ever ordered a vegetarian dish… but with a description like that…. could I really be blamed? Plus, there is something savory about brussels and the hearty tomato base that quiets that meat eating need. 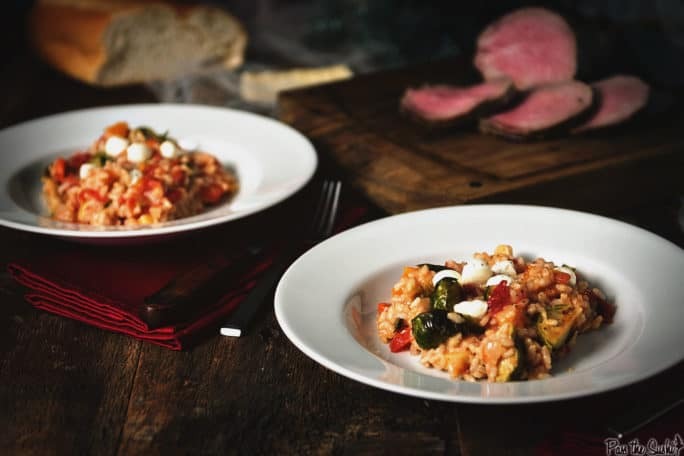 Whether the star of the show, or paired with a beautiful roast, this creamy veggie risotto should be a happy place for all of us! Go on, give it a try! For more killer side dishes, be sure to check these out! If you’ve tried my Fall Veggie Risotto recipe or any other recipe on passthesushi.com please don’t forget to rate the recipe and let me know where you found it in the comments below, I love hearing from you! You can also follow along for more good eats and travel tips on Instagram @passthesushi & @girlcarnivore, Twitter & Facebook. Preheat your oven to 425 degrees F. Line a baking sheet with foil. Toss the Brussels, butternut squash, and carrots with olive oil. Season with salt and pepper and arrange on the baking sheet in a single layer. Toss in the oven to roast for about 25 minutes, stirring once, halfway through cook time. Add the red pepper for the last 8 to 10 minutes of cook time. Meanwhile, in a large pot, bring the broth and water to a boil. Reduce heat to low and allow to simmer. In a large dutch oven over medium heat, melt 2 tbs butter. Swirl to coat pan. Add the onion and season with salt, Cook until the onion has softened, stirring, 5 to 7 minutes. Add the garlic and cook for 30 seconds. Add the rice, and toast for about 3 minutes, stirring often. The edges of the rice will become translucent. Add the wine and cook for 2 to 3 minutes, stirring constantly. Add the tomatoes. Ladle in 5 cups of the simmering broth to the rice mixture and cook over medium-low heat, covered, for 15-20 minutes, until most of the liquid has been absorbed. Stir only a few times while cooking. Let the rice work it's magic. Finally, stir in 3/4 cups of the remaining broth into the rice. Remove from heat and stir in the roasted veggies and a few of the mozzarella balls. Stir in the remaining 2 tablespoons butter and season with salt and pepper to taste. Serve on platters and sprinkle each serving with a few of the mozzarella balls. Oh heck yes! I’m so excited that you made this! That risotto was awesome regardless of us splitting it along with the roast. Oh yum, Jason is going to want me to make him this! I love risotto! It’s so rich and creamy. this looks great! Risotto is one of those guilty pleasures that I never really get to enjoy unless I am out at a restaurant. This look absolutely divine!